Kauai is often referred to as the Garden Isle. 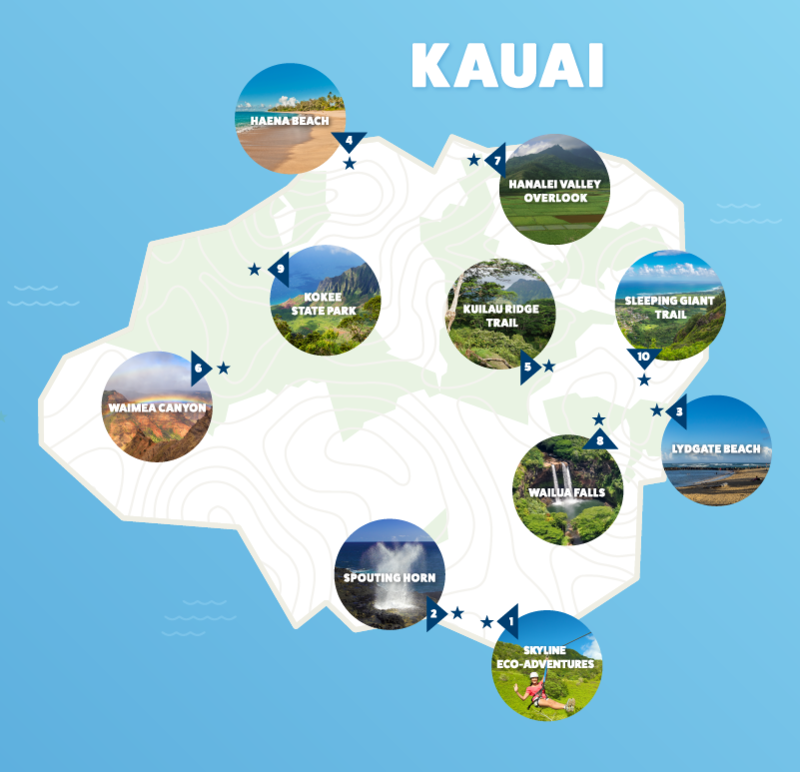 As this nickname implies, there are a lot of amazing things to do and see outside while on Kauai. Here are 10 budget-friendly things to do on this beautiful, green Hawaiian island. Skyline Eco-Adventures has 2 zipline tour options on Kauai: the 8-line tour and the 5-line tour. The epic 5-line tour is regularly priced at $109.95 but when you book this tour online, it is only $99.95. This tour is great for families! The minimum age requirement is 8 years old and the minimum weight requirement is 60 pounds. If you will be ziplining with kids ages 13 and under, you will save $50 off of each child’s ticket when you book online- bringing the price to only $59.95! That is such a good deal for 1.5 hours of thrilling fun and beautiful views! This cool geographic formation is one of the most photographed spots in Kauai for a good reason. As ocean waves crash into a lava tube that is located just below the ocean’s surface, the water is forced through the tube and into the air like a geyser. This natural wonder is located in Poipu Beach Park on Kauai and is completely free to see. This famous beach is a very kid-friendly spot to hang out for the day. There are two ponds that are formed by rocks in the shallow ocean water, so the water in these spots is very calm and shallow. Also, there is a great playground for kids on the beach. This beach is a great spot to swim and snorkel on calm days. You can also find a lot of beautiful seashells in the sand here. This beach is also a favorite camping spot among locals. Opting to camp here can be a very cheap way to enjoy the beauty of Kauai with your friends. Hiking this 2.25-mile trail offers beautiful views of the Makaleha Mountain Range. This hike is beautiful and also a pretty good workout because most of the trail is uphill. This canyon is often called “the grand canyon of the Pacific” and is a state park on Kauai. This canyon is quite a sight to see. It is 10 miles long and 3,600 feet deep. When you look into the canyon, you will see the Waimea River, waterfalls, and possibly even colorful rainbows. This overlook is located on the side of Namolokama mountain near Princeville and Hanalei. From this overlook, you will find countless, beautiful photo opportunities. You won’t want to miss these views! This double waterfall is a well-known symbol of Kauai’s beauty. This waterfall is very, very easy to get to and virtually no hiking is required to get this beautiful waterfall up close. The best time to visit this waterfall is right after sunrise because the rising sun hits the falls just right during this time of day and creates a colorful rainbow display. This state park is located on the north side of the Waimea Canyon and has over 40 miles of hiking trails for you to explore. There are so many beautiful things to see in this state park. This hiking trail is also known as the Nounou trail. It is actually one of the three Nounou Mountain hiking trails on Kauai. You will get to enjoy views of Kauai’s east coast, the Wailua river, and many other beautiful sights.